In this sculpture I explore the contemporary practices of tattoos and automotive accessories through an historical framework. Using cast body filler arabesques and floral motifs, cake decorating flowers, and chrome accents from automotive and scrap-booking sources, I transfigure a fender into a Rococo cartouche. In Rococo design, arabesques served as the decorative connectivity in which oriental, exotic, fanciful, absurd, and disparate motifs made sense. Using the familiar trope of Rococo ornamentation, I call into question the unrelated iconography of contemporary automotive decoration, such as Chinese characters, flames, tropical flowers, and skulls. 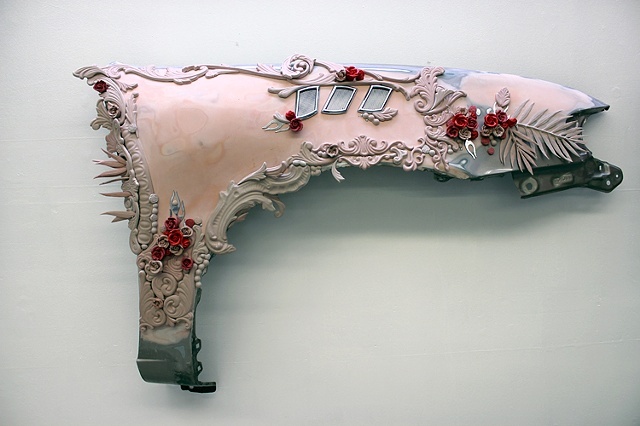 By using a Toyota fender as the carrier for this ornamentation, I reference not only the popularity of exotic and oriental decoration in both Rococo and contemporary decoration, but also the political parallels of both eras: imperialism and globalization.